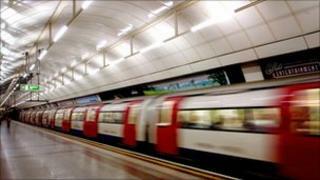 Services on two Tube lines are set to be disrupted by a 24-hour walkout by train crews at two London train depots. The RMT union has told workers at the Bakerloo depot at Elephant and Castle to strike from 2100 GMT on Friday, 17 December. Crews at the Northern line depot at Morden in south London have been instructed to strike at the same time. The action is over one driver facing disciplinary action and the dismissal of another driver. RMT general secretary Bob Crow said both disputes were "clear-cut cases of victimisation on the grounds of trade union activity". London Underground (LU) said only 19% of RMT's Northern line staff had voted for strike action, while it was "utterly outrageous" for the union to threaten action "in support of someone dismissed for a serious breach of safety rules on the Bakerloo line". Howard Collins, LU's chief operating officer, said: "The Bakerloo line mandate is flimsy at best, while Northern line staff have completely rejected the call for unjustified strike action." Members of the RMT union working on the Northern line had rejected strikes in support of a driver facing disciplinary action. Meanwhile, on the Bakerloo line, 42 RMT members voted for walkouts out of 119 balloted over the dismissal of a driver. "It is completely irresponsible for the RMT to threaten strike action in support of these drivers," Mr Collins said. But an RMT spokesman said the strike was "completely legal". "If you had to get more than 50% on a vote to be legal, the Mayor of London and many members of Parliament wouldn't hold their positions," he said. Mr Crow said:"Instead of harassing our members and activists on trumped up charges the London Underground management should be directing their energies into reaching a settlement to the on-going disputes over tube safety and safe staffing levels."